A campaign for another EU referendum - this time on the final Brexit deal - has been launched in London. 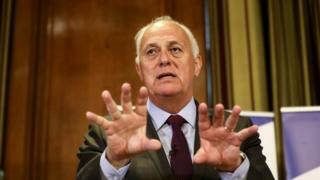 Chairman Lord Malloch-Brown, a former Labour minister, said it was "time for the truth" about what leaving the EU would mean. The group, backed by billionaire George Soros, hopes to build support for a referendum on the deal over the summer. The prime minister's spokesman said: "There isn't going to be a second referendum." If successful, the group says a "people's vote" on whether to accept the final deal - which would include the option of remaining in the EU - could be held before Brexit in March 2019. Lord Malloch-Brown, a former UN deputy secretary general, said the "chronic uncertainty" surrounding Brexit talks was harming business and it was "time to settle this once and for all". He said the campaign would accept the outcome of any referendum but it was "time for the truth and nothing but the truth" on Brexit, rather than "false facts" on the side of buses and "project fear". Best for Britain says it will be campaigning in 70 "key" constituencies over the summer to urge MPs to back its plan and says it will be "talking to people on the doorstep about how Brexit is affecting them". Pro-Brexit campaign group Leave.EU have attacked Lord Malloch-Brown as a "puppet for George Soros" and chief "Remoaner," while another group, Leave Means Leave, has launched a fundraising drive among supporters to "secure the swift, clean Brexit you all voted for". Lord Malloch-Brown denied Best for Britain was a "puppet" of a foreign donor because it took 20% of its funding from Mr Soros - and he insisted he was not embarrassed to take the Hungarian-American tycoon's money. "Like him, I am very proud of a career spent in international human rights, promoting democracy and trying to secure healthy democratic cultures in countries everywhere. "I never expected to be doing it back home, but I'm pleased to be doing so."